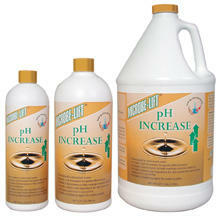 Assists in maintaining the proper pH level in your pond. Use after your pH is in a normal range (7.0 to 7.9) Helps to prevent wide pH swings from dawn to dusk due to respiration and photosynthesis. 2# container. High pH can be harmful to your fish as well as your aquatic plants. 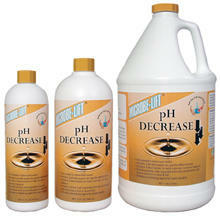 PondCare pH down SLOWLY adjusts the pH of the pond water without harming delicate pond fish or pond plants. 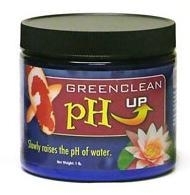 Phosphate free and will not promote algae growth. Amount treated depends on the degree of change in pH required. 16oz Add one oz per 300 gallons of pond water per treatment. Test water in 24 hours and repeat as necessary. 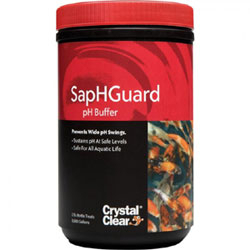 SLOWLY adjusts pH of pond water without harming delicate pond fish or pond plants. Phosphate free and will not promote algae growth. Amount treated depends on the degree of change in pH required. 16oz Add one oz per 150 gallons of pond water per treatment. Test water in 24 hours and repeat as necessary.